Stacking the Deck: So what's the deal with the shoes? Honestly, the whole thing started out simple enough. I needed new shoes. Nothing fancy, just new shoes. And they had to be comfortable. Hey, in my line of work, I may be sitting in front of the computer a lot typing, but there are times I've got to clear a couple of football fields worth of space in just a few minutes when moving from meeting to meeting at shows. So I made a quick trip to Target. Yes, I just said "Target". 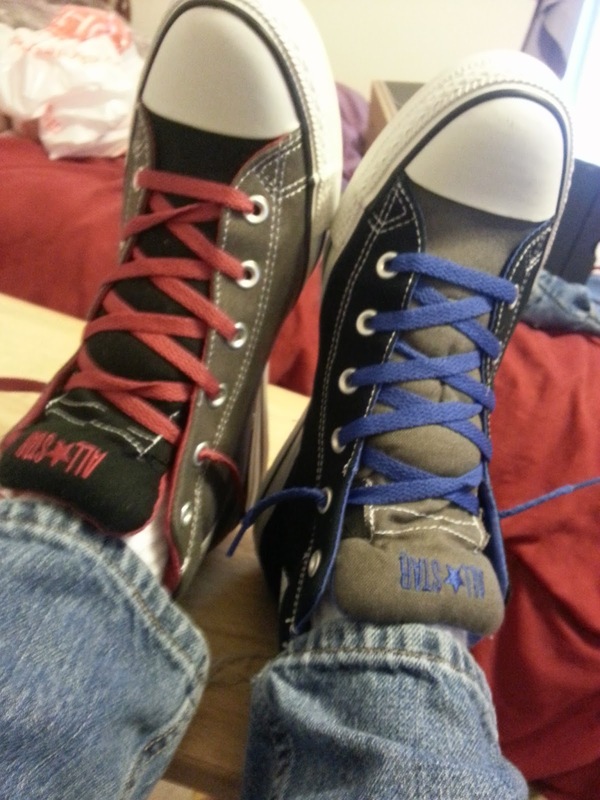 Hey, I've gotten some damn good stuff there, including a former favorite pair of red Converse. But I digress. I made a quick trip to Target and found some shoes. And since I tend to put a beating on the footwear, I decided to pick up an extra pair, only they didn't have the same color. 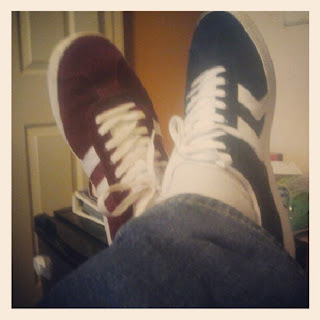 So, at the end of my little excursion, I wound up with two pairs of the exact same style of shoe ... one pair red, and the other blue. The story would have probably ended there (and been a lot more boring) if not for one of my closest friends, Marcia Webb, co-founder of The Mommy Gamers [There's a plug for ya, Marcia]. Somehow, during one of our brainstorming sessions on taking over the world, she noticed the red shoes and commented on them. When I told her about the second pair, she offhandedly (and quite sarcastically) said, "You should mess with people and wear one of each." I decided "Why the hell not?" and figured it's be good for a chuckle or two. Plus, if people on the street noticed it, I'd certainly stand out a little more while working. It was also fun to come up with witty (or smartassed, depending on who you ask) comebacks when asked about it. "Funny, I've got another pair almost exactly like these." "Can't you tell? My feet are in 3D!!" "They look the same shade of grey to me." And so, the joke started. But then, over time, the "joke" grew and mutated into something more than a funny punchline and a cheap grab for attention. It became a sort of pseudo-signature for me. It was something unique to me and it was also a constant. Better still, I found a sort of Zen in it. Good and bad, dark and light, highs and lows, yin and yang ... it was a reminder of extremes, that they're part of the greater whole, and that you can still move where you need to be through those extremes. It sounds strange to say that I found bit of direction by looking at my feet. Actually, that sounds like something you'd read in a fortune cookie. Doesn't make it any less true, though. Plus, hell ... they looked cool. Eventually, as with many things in life, the shoes reached the end of their lives. It was time to replace them with something new. I decided to go back to the Converse because a) they're comfortable and b) they're iconic. Of course, by this time, I've kinda gotten attached to my quirky Zen approach to my shoes. So it was a matter of finding a similar mix and match. Looking at the picture here, you can see I did pretty good, finding two pair that are virtual negatives of each other. The whole yin and yang motif is still there and it still reminds me of the extremes in life and give me one little unique feature to stand out and be remembered. And trust me, in MY business, it really does pay to be remembered. You blogged about shoes. You're officially a woman now. I blogged about the quirky origin of WHY I wear the mismatched shoes in public and explained the method behind my madness. In fact, it's still partially YOUR fault. Heh.